This is the first of a three-article series on Virtual Intelligence and its applications in petroleum and natural gas engineering. In addition to discussing artificial neural networks, the series will include articles on evolutionary programming and fuzzy logic. Intelligent hybrid systems that incorporate an integration of two or more of these paradigms and their application in the oil and gas industry will also be discussed in these articles. The intended audience is the petroleum professional that is not quite familiar with virtual intelligence but would like to know more about this technology and its potentials. Those with a prior understanding and experience of the technology will also find the articles useful and informative. In this section some historical background of the technology will be mentioned followed by definitions of virtual intelligence and artificial neural networks. After the definitions, more general information on the nature and mechanism of the artificial neural network and its relevance to biological neural networks will be offered. Virtual intelligence has been called by different names. It has been referred to as "artificial intelligence", "computational intelligence" and "soft computing". There seems not to be a uniformly acceptable name for this collection of analytic tools among the researchers and practitioners of the technology. Among these names "artificial intelligence" is used the least as an umbrella term. This is due to the fact that "artificial intelligence" has been historically referred to rule-based expert systems and today is used synonymously with expert systems. Expert systems made many promises of delivering intelligent computers and programs, but these promises never materialized. Many believe that term "soft computing" is the most appropriate term to be used and "virtual intelligence" is a subset of "soft computing". Although there is merit to this argument we will continue using the term "virtual intelligence" throughout these articles. Virtual intelligence may be defined as a collection of new analytic tools that attempts to imitate life1. Virtual intelligence techniques exhibit an ability to learn and deal with new situations. Artificial neural networks, evolutionary programming and fuzzy logic are among the paradigms that are classified as virtual intelligence. These techniques possess one or more attributes of "reason", such as generalization, discovery, association and abstraction2. In the last decade virtual intelligence has matured to a set of analytic tools that facilitate solving problems that were previously difficult or impossible to solve. The trend now seems to be the integration of these tools together, as well as with conventional tools such as statistical analysis, to build sophisticated systems that can solve challenging problems. These tools are now used in many different disciplines and have found their way into commercial products. Virtual intelligence is used in areas such as medical diagnosis, credit card fraud detection, bank loan approval, smart household appliances, subway systems, automatic transmissions, financial portfolio management, robot navigation systems, and many more. In the oil and gas industry these tools have been used to solve problems related to pressure transient analysis, well log interpretation, reservoir characterization, and candidate well selection for stimulation, among other things. Neural network research can be traced back to a paper by McCulloch and Pitts3 in 1943. In 1957 Frank Rosenblatt invented the Perceptron4. Rosenblatt proved that given linearly separable classes, a perceptron would, in a finite number of training trials, develop a weight vector that will separate the classes (a pattern classification task). He also showed that his proof holds independent of the starting value of the weights. Around the same time Widrow and Hoff5 developed a similar network called Adeline. Minskey and Papert6 in a book called "Perceptrons" pointed out that the theorem obviously applies to those problems that the structure is capable of computing. They showed that elementary calculation such as simple "exclusive or" (XOR) problems cannot be solved by single layer perceptrons. Rosenblatt4 had also studied structures with more layers and believed that they could overcome the limitations of simple perceptrons. However, there was no learning algorithm known which could determine the weights necessary to implement a given calculation. Minskey and Papert6 doubted that one could be found and recommended that other approaches to artificial intelligence should be pursued. Following this discussion, most of the computer science community left the neural network paradigm for twenty years7. In early 1980s Hopfield was able to revive the neural network research. Hopfield's efforts coincided with development of new learning algorithms such as backpropagation. The growth of neural network research and applications has been phenomenal since this revival. An artificial neural network is an information processing system that has certain performance characteristics in common with biological neural networks. Therefore it is appropriate to describe briefly a biological neural network before offering a detail definition of artificial neural networks. All living organisms are made up of cells. The basic building blocks of the nervous system are nerve cells, called neurons. Figure 1 shows a schematic diagram of two bipolar neurons. Figure 1. Schematic diagram of two bipolar neurons. A typical neuron contains a cell body where the nucleus is located, dendrites and an axon. Information in the form of a train of electro-chemical pulses (signals) enters the cell body from the dendrites. Based on the nature of this input the neuron will activate in an excitatory or inhibitory fashion and provides an output that will travel through the axon and connects to other neurons where it becomes the input to the receiving neuron. 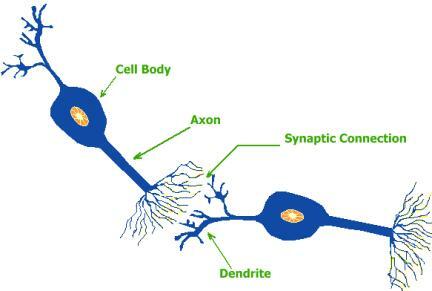 The point between two neurons in a neural pathway, where the termination of the axon of one neuron comes into close proximity with the cell body or dendrites of another, is called a synapse. The signals traveling from the first neuron initiate a train of electro-chemical pulse (signals) in the second neuron. It is estimated that the human brain contains on the order of 10 to 500 billion neurons8. These neurons are divided into modules and each module contains about 500 neural networks9. Each network may contain about 100,000 neurons in which each neuron is connected to hundreds to thousands of other neurons. This architecture is the main driving force behind the complex behavior that comes so natural to us. Simple tasks such as catching a ball, drinking a glass of water or walking in a crowded market require so many complex and coordinated calculations that sophisticated computers are unable to undertake the task, and yet is done routinely by humans without a moment of thought. This becomes even more interesting when one realizes that neurons in the human brain have cycle time of about 10 to 100 milliseconds while the cycle time of a typical desktop computer chip is measured in nanoseconds. The human brain, although million times slower than common desktop PCs, can perform many tasks orders of magnitude faster than computers because of it massively parallel architecture. Information processing occurs in many simple elements that are called neurons (processing elements). Signals are passed between neurons over connection links. Each connection link has an associated weight, which, in a typical neural network, multiplies the signal being transmitted. Each neuron applies an activation function (usually non-linear) to its net input to determine its output signal10. Figure 2 is a schematic diagram of a typical neuron (processing element) in an artificial neural network. Output from other neurons is multiplied by the weight of the connection and enters the neuron as input. Therefore an artificial neuron has many inputs and only one output. The inputs are summed and subsequently applied to the activation function and the result is the output of the neuron. Figure 2. Schematic diagram of an artificial neuron or a processing element. An artificial neural network is a collection of neurons that are arranged in specific formations. Neurons are grouped into layers. In a multi-layer network there are usually an input layer, one or more hidden layers and an output layer. The number of neurons in the input layer corresponds to the number of parameters that are being presented to the network as input. The same is true for the output layer. It should be noted that neural network analysis is not limited to a single output and that neural nets can be trained to build neuro-models with multiple outputs. The neurons in the hidden layer or layers are mainly responsible for feature extraction. They provide increased dimensionality and accommodate tasks such as classification and pattern recognition. Figure 3 is a schematic diagram of a fully connected three layered neural network. There are many kinds of neural networks. Neural network scientists and practitioners have provided different classifications for neural networks. One of the most popular classifications is based on the training methods. Neural nets can be divided into two major categories based on the training methods, namely supervised and unsupervised neural networks. Unsupervised neural networks, also known as self-organizing maps, are mainly clustering and classification algorithms. They have been used in oil and gas industry to interpret well logs and to identify lithology. They are called unsupervised simply because no feedback is provided to the network. The network is asked to classify the input vectors into groups and clusters. This requires a certain degree of redundancy in the input data and hence the notion that redundancy is knowledge11. Figure 3. Schematic diagram of a three-layer neuron network. Most of the neural network applications in the oil and gas industry are based on supervised training algorithms. During a supervised training process both input and output are presented to the network to permit learning on a feedback basis. A specific architecture, topology and training algorithm is selected and the network is trained until it converges. During the training process neural network tries to converge to an internal representation of the system behavior. Although by definition neural nets are model-free function approximators, some people choose to call the trained network a neuro-model. The connections correspond roughly to the axons and synapses in a biological system, and they provide a signal transmission pathway between the nodes. Several layers can be interconnected. The layer that receives the inputs is called the input layer. It typically performs no function other than the buffering of the input signal. The network outputs are generated from the output layer. Any other layers are called hidden layers because they are internal to the network and have no direct contact with the external environment. Sometimes they are likened to a "black box" within the network system. However, just because they are not immediately visible does not mean that one cannot examine the function of those layers. There may be zero to several hidden layers. In a fully connected network every output from one layer is passed along to every node in the next layer. In a typical neural data processing procedure, the database is divided into three separate portions called training, calibration and verification sets. The training set is used to develop the desired network. In this process (depending on the paradigm that is being used), the desired output in the training set is used to help the network adjust the weights between its neurons or processing elements. During the training process the question arises as when to stop the training. How many times should the network go through the data in the training set in order to learn the system behavior? When should the training stop? These are legitimate questions, since a network can be over trained. In the neural network related literature over-training is also referred to as memorization. Once the network memorizes a data set, it would be incapable of generalization. It will fit the training data set quite accurately, but suffers in generalization. Performance of an over-trained neural network is similar to a complex non-linear regression analysis. Over-training does not apply to some neural network paradigms simply because they are not trained using an iterative process. Memorization and over-training is applicable to those networks that are historically among the most popular ones for engineering problem solving. These include back-propagation networks that use an iterative process during the training. In order to avoid over training or memorization, it is a common practice to stop the training process every so often and apply the network to the calibration data set. Since the output of the calibration data set is not presented to the network, one can evaluate network's generalization capabilities by how well it predicts the calibration set's output. Once the training process is completed successfully, the network is applied to the Verification Data Set. Figure 4. Commonly used activation functions in artificial neurons. During the training process each artificial neuron (processing element) handles several basic functions. First, it evaluates input signals and determines the strength of each one. Second, it calculates a total for the combined input signals and compares that total to some threshold level. Finally, it determines what the output should be. The transformation of the input to output - within a neuron - takes place using an activation function. Figure 4 shows two of the commonly used activation (transfer) functions. All the inputs come into a processing element simultaneously. In response, neuron either "fires" or "doesn't fire", depending on some threshold level. The neuron will be allowed a single output signal, just as in a biological neuron - many inputs, one output. In addition, just as things other than inputs affect real neurons, some networks provide a mechanism for other influences. Sometimes this extra input is called a bias term, or a forcing term. It could also be a forgetting term, when a system needs to unlearn something12. Initially each input is assigned a random relative weight (in some advanced applications – based on the experience of the practitioner - the relative weight assigned initially may not be random). During the training process the weight of the inputs is adjusted. The weight of the input represents the strength of its connection to the neuron in the next layer. The weight of the connection will affect the impact and the influence of that input. This is similar to the varying synaptic strengths of biological neurons. Some inputs are more important than others in the way they combine to produce an impulse. Weights are adaptive coefficients within the network that determine the intensity of the input signal. The initial weight for a processing element could be modified in response to various inputs and according to the network's own rules for modification. Mathematically, we could look at the inputs and the weights on the inputs as vectors, such as II, I2 . . . In for inputs and Wl, W2 . . . Wn for weights. The total input signal is the dot, or inner, product of the two vectors. Geometrically, the inner product of two vectors can be considered a measure of their similarity. The inner product is at its maximum if the vectors point in the same direction. If the vectors point in opposite directions (180 degrees), their inner product is at its minimum. Signals coming into a neuron can be positive (excitatory) or negative (inhibitory). A positive input promotes the firing of the processing element, whereas a negative input tends to keep the processing element from firing. During the training process some local memory can be attached to the processing element to store the results (weights) of previous computations. Training is accomplished by modification of the weights on a continuous basis until convergence is reached. The ability to change the weights allows the network to modify its behavior in response to its inputs, or to learn. For example, sup­pose a network identifies a production well as "an injection well". On successive iterations (training), connection weights that respond correctly to a production well are strengthened and those that respond to others, such as an injection well, are weakened until they fall below the threshold level and the correct recognition of the well is achieved. In the back propagation algorithm (one of the most commonly used supervised training algorithms) the network output is compared with the desired output - which is part of the training data set, and the difference (error) is propagated backward through the network. During this back propagation of error the weights of the connections between neurons are adjusted. This process is continued in an iterative manner. The network converges when its output is within acceptable proximity of the desired output. Common sense indicates that if a problem can be solved using conventional methods, one should not use neural networks or any other virtual intelligence technique to solve them. For example, balancing your checkbook using a neural network is not recommended. Although there is academic value to solving simple problems, such as polynomials and differential equations, using neural networks to show its capabilities, they should be used mainly in solving problems that otherwise are very time consuming or simply impossible to solve by conventional methods. Neural networks have shown great potential for generating accurate analysis and results from large historical databases. The kind of data that engineers may not consider valuable or relevant in conventional modeling and analysis processes. Neural networks should be used in cases where mathematical modeling is not a practical option. This may be due to the fact that all the parameters involved in a particular process are not known and/or the inter-relation of the parameters is too complicated for mathematical modeling of the system. In such cases a neural network can be constructed to observe the system behavior (what types of output is produced as a result of certain set of inputs) and try to mimic its functionality and behavior. In this section few examples of applying artificial neural networks to petroleum engineering related problems is presented. Neural networks have been utilized to predict or virtually measure formation characteristics such as porosity, permeability and fluid saturation from conventional well logs13-15. Using well logs as input data coupled with core analysis of the corresponding depth, these reservoir characteristics were successfully predicted for a heterogeneous formation in West Virginia. There have been many attempts to correlate permeability with core porosity and/or well logs using mathematical or statistical functions since the early 1960s16. It was shown that a carefully orchestrated neural network analysis is capable of providing more accurate and repeatable results when compared to methods used previously17. Figure 5 is a cross-plot of porosity versus permeability for the "Big Injun" formation in West Virginia. It is obvious that there are no apparent correlation between porosity and permeability in this formation. The scatter of this plot is mainly due to the complex and heterogeneous nature of this reservoir. Figure 5. Porosity and permeability cross-plot for Big Injune formation. Well logs provide a wealth of information about the rock, but they fall short in measurement and calculation of its permeability. Dependencies of rock permeability on parameters that can be measured by well logs have remained one of the fundamental research areas in petroleum engineering. Using the conventional computing tools available, scientists have not been able to prove that a certain functional relationship exists that can explain the relationships in a rigorous and universal manner. Author suggest that if such dependency or functional relation exists, an artificial neural network is the tool to find it. Using geophysical well log data as input (bulk density, gamma ray, and induction logs), a neural network was trained to predict formation permeability measured from laboratory core analyses. Log and core permeability data were available from four wells. The network was trained with the data from three wells and attempted to predict the measurements from the fourth well. This practice was repeated twice each time using a different well as the verification well. Figures 6 and 7 show the result of neural network's prediction compared to the actual laboratory measurements. Please note that the well logs and core measurements from these test wells were not used during the training process. In a similar process well logs were used to predict (virtually measure) effective porosity and fluid saturation in this formation. The results of this study are shown in Figures 8 through 10. In these figures solid lines show the neural network's predictions. The core measurements are shown using two different symbols. The circles are those core measurements that were used during the training process and the triangles are the core measurements that were never seen by the network. Figure 6. Core and network permeability for well 1110 in Big Injun formation. Figure 7. Core and network permeability for well 1126 in Big Injun formation. Figure 8. Core and network effective porosity for well 1109 and 1126 in Big Injun formation. Figure 9. Core and network oil saturation for well 1109 and 1128 in Big Injun formation. Figure 10. Core and network water saturation for well 1109 and 1128 in Big Injun formation. Magnetic Resonance Imaging logs are well logs that use nuclear magnetic resonance to measure free fluid, irreducible water (MBVI), and effective porosity (MPHI) accurately. Permeability is then calculated using a mathematical function that incorporates these measured properties. MRI logs can provide information that results in an increase in the recoverable reserve. This takes place simply by including the portions of the pay zone into the recoverable reserve calculations that were excluded during the analysis using only the conventional well logs. MRI logs accomplishes this task by estimating the economically recoverable hydrocarbon (identification of a combination of water and hydrocarbon saturation as well as the reservoir permeability) that has been overlooked. In a recent paper it was shown that neural networks have the potential to be used as an analytical tool for generation of synthetic magnetic resonance imaging logs from conventional geophysical well logs18. In this study four wells from different locations in the United States were used to show the potential of this proposed approach. These wells were from Utah, Gulf of Mexico, East Texas and New Mexico. In each case part of the well data is used to train a neural network and the rest of the rest of the well data are used as verification. As it is mentioned in the paper this method is most useful for fields with many wells from which only a handful need to be logged using magnetic resonance imaging tools. These wells can be strategically placed to capture as much reservoir variation as possible. Then a virtual MRI application can be developed based on these wells and applied to the rest of the wells in the field. Figure 11 is an example for such a strategy. Figure 11. 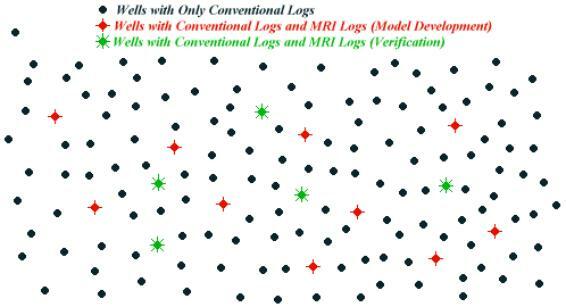 Using virtual MRI log methodology in a typical field. Table 1 shows the accuracy of this methodology when applied to the four wells being studied. For each well the methodology was applied to three different MRI logs namely MPHI (effective porosity), MBVI (irreducible water saturation), and MPERM (permeability). For each log the table shows the correlation coefficient both for the entire well data set (training data and verification data) and for only the Verification Data Set. The Verification Data Set includes data that had not been seen previously by the network. The correlation coefficient of this methodology ranges from 0.80 to 0.97. As expected, the correlation coefficient for the entire well data set is better than that of the Verification Data Set. This is due to the fact that the training data set is included in the entire well data set and that correlation coefficient for the training data is usually higher than the Verification Data Set. Table 1. Results of virtual MRI logs for four wells in the United States. MRI logs are also used to provide a more realistic estimate of recoverable reserve as compared to conventional well logs. Table 2 shows the recoverable reserve calculated using actual and virtual MRI logs. Recoverable reserve calculations based on virtual MRI logs are quite close to those of actual MRI logs since during the reserve calculation a certain degree of averaging takes place that compensates for some of the inaccuracies that are associated with virtual MRI logs. As shown in Table 2 in all four cases the recoverable reserve calculated using Virtual MRI logs are within 2% of those calculated using actual MRI logs. In the case of the well in the Gulf of Mexico the percent difference is about 0.3%. Although there is not enough evidence to make definitive conclusions at this point, but it seems that recoverable reserve calculated using virtual MRI logs are mostly on the conservative sides. Table 2. Recoverable reserve calculations using actual and virtual MRI logs. Figures 12 and 13 show the comparison between actual and virtual MRI logs for the well located in East Texas. Figure 12. Virtual MRI log results for the well in East Texas, for Verification Data Set and the entire well data set. Figure 13. Actual and Virtual MRI log results for the well in East Texas. There are many more applications of neural networks in the oil and gas industry. They include application to field development19, two-phase flow in pipes20-21, identification of well test interpretation models22-24, completion analysis25-26, formation damage prediction27, permeability prediction28-29, and fractured reservoirs30-31. Author Alvin Toeffler has been quoted to say, "The responsibility for change … lies within us. We must begin with ourselves, teaching ourselves not to close our minds prematurely to the novel, the surprising, and the seemingly radical". Virtual intelligence in general and artificial neural networks specifically has advanced substantially in the past decade. There are many everyday applications and products that use these tools to make life easier for human kind. Petroleum engineers historically have been among the most open-minded scientists and practitioners that have embraced new technology and turned it to the task of problem solving. Neural network seems to be one of the newest tools that is finding its way into the oil and gas industry as an alternative analytical method. This technology is in its infancy and has great potential. Most of neural network application of today is conducted in the software domain. Hardware implementations have already started becoming more and more popular. The integration of neural networks with fuzzy logic and genetic programming techniques (that will be covered in the next articles) is providing ever more powerful tools. A word of caution seems to be appropriate at this time. It has been the observation of this author – which seems to be shared by other neural network practitioners in our field - that successful application of neural networks to complex and challenging problems is directly related to the experience one will gain by working with this tool and its many variations. Therefore, failure of early attempts to solve complex problems should not cause the user to despair of the technology. Of course, even novice users of the technology can achieve good results when solving straightforward problems using neural networks. Zaruda, J. M. Marks, R. J., Robinson, C. J. "Computational Intelligence, Imitating Life", IEEE Press, Piscataway, NJ, 1994. McCulloch, W. S., and Pitts, W. "A Logical Calculus of Ideas Immanent in Nervous Activity", Bulletin of Mathematical Biophysics, 5, pp. 115 - 133, 1943. Rosenblatt, F., "The Perceptron: Probabilistic Model for Information Storage and Organization in the Brain", Psychol. Rev. 65, pp. 386-408, 1958. Widrow, B., "Generalization and Information Storage in Networks of Adeline Neurons, Self-Organizing Systems", Yovitz, M.C., Jacobi, G. T., and Goldstein, G. D. editors, pp. 435 - 461, Chicago, 1962. Minsky, M. L. and Papert, S. A. , "Perceptrons", MIT Press, Cambridge, MA, 1969. Hertz, J., Krogh, A., Palmer, R. G. "Introduction to the Theory of Neural Computation", Addison-Wesley Publishing Company, Redwood City, CA, 1991. Rumelhart, D. E., and McClelland, J. L. , "Parallel Distributed processing, Exploration in the Microstructure of Cognition, Vol. 1: Foundations", MIT Press, Cambridge, MA, 1986. Stubbs, D. Neurocomputers. , "M. D. Computing", 5(3): 14-24, 1988. Fausett, L. "Fundamentals of Neural Networks, Architectures, Algorithms, and Applications", Prentice Hall, Englewood Cliffs, NJ, 1994. Barlow, H. B. Unsupervised learning. Neural Computation 1, 295-311, 1988. McCord Nelson, M., and Illingworth, W.T. "A Practical Guide to Neural Nets", Addison-Wesley Publishing, Reading, MA 1990. Mohaghegh, S., Arefi, R., Bilgesu, I., Ameri, S. "Design and Development of an Artificial Neural Network for Estimation of Formation Permeability", SPE Computer Applications, December 1995, pp. 151-154. Mohaghegh, S., Arefi, R., Ameri, S. "Petroleum Reservoir Characterization with the Aid of Artificial Neural Networks", Journal of Petroleum Science and Engineering, 16, 1996, pp. 263-274. Mohaghegh, S., Ameri, S., and Arefi, R. "Virtual Measurement of Heterogeneous Formation Permeability Using Geophysical Well Log Responses", The Log Analyst, March/April 1996, pp. 32-39. Balan, B., Mohaghegh, S., and Ameri, S. "State-of-the-art in Permeability Determination From Well Log Data: Part 1: A Comparative Study, Model Development", SPE 30978, Proceedings, SPE Easter Regional Conference Sept. 17-21, 1995, Morgantown, WV. Mohaghegh, S., Balan, B., and Ameri, S. "State-of-the-art in Permeability Determination From Well Log Data: Part 2: Verifiable, Accurate Permeability Prediction, the Touch-Stone of All Models", SPE 30979, Proceedings, SPE Easter Regional Conference Sept. 17-21, 1995, Morgantown, WV. Mohaghegh, S., Richardson, M., and Ameri, M. "Virtual Magnetic Resonance Imaging Logs: Generation of Synthetic MRI Logs From Conventional Well Logs", SPE 51075, Proceedings, SPE Eastern Regional Conference Nov. 9-11, 1998, Pittsburgh, PA.
Doraisamy, H., Ertekin, T., Grader, A. "Key Parameters Controlling the Performance of Neuro Simulation Applications in Field Development", SPE 51079, Proceedings, SPE Eastern Regional Conference Nov. 9-11, 1998, Pittsburgh, PA.
Ternyik, J., Bilgesu, I., Mohaghegh, S., and Rose, D. "Virtual Measurement in Pipes, Part 1: Flowing Bottomhole Pressure Under Multi-phase Flow and Inclined Wellbore Conditions", SPE 30975, Proceedings, SPE Eastern Regional Conference and Exhibition, September 19-21, 1995, Morgantown, West Virginia. Sung, W., Hanyang, U., Yoo, I. "Development of HT-BP Neural Network System for the Identification of Well Test Interpretation Model", SPE 30974, Proceedings, SPE Eastern Regional Conference and Exhibition, September 19-21, 1995, Morgantown, West Virginia. Juniardi, I. J., Ershaghi, I. "Complexities of Using Neural Networks In Well Test Analysis of Faulted Reservoir", SPE 26106, Proceedings, SPE Western Regional Meeting, 26‑28 March 1993, Anchorage, Alaska. Shelley, R., Massengill, D., Scheuerman, P., McRill, P., Hamilton, R. "Granite Wash Completion Optimization with the Aid of Artificial Neural Networks", SPE 39814, Proceedings, Gas Technology Symposium, March 15-18, 1998, Calgary, Alberta. Shelley, R., Stephenson, S., Haley, W., Craig, E. "Red Fork Completion Analysis with the Aid of Artificial Neural Networks", SPE 39963, Proceedings, Rocky Mountain Regional Meeting / Low Permeability Reservoir Symposium, April 5-8, 1998, Denver, CO.
Nikravesh, M., Kovscek, A. R., Jonston, R. M., and Patsek, T. W. "Prediction of Formation Damage During the Fluid Injection into Fractured Low Permeability Reservoirs via Neural networks", SPE 31103, Proceedings, SPE Formation Damage Symposium, Feb. 16-18, 1996, Lafayette, LA. Wong, P. M., Taggart, I. J., Jian, F. X. "A Critical Comparison of Neural networks and Discriminant Analysis in Lithofacies, Porosity and Permeability Predictions", Journal of Petroleum Geology, 18 (2), pp. 191-206, 1995. Wong, P. M., Henderson, D. J., Brooks, L. J. "Permeability Determination using Neural Networks in the Ravva Field, Offshore India", SPE reservoir Evaluation and Engineering 1 (2), pp. 99-104, 1998. Ouense, A., Zellou, A., Basinski, P. M., and Head, C. F. "Use of Neural Networks in Tight Gas Fractured Reservoirs: Application to San Juan Basin", SPE 39965, Proceedings, Rocky Mountain Regional Meeting / Low Permeability Reservoir Symposium, April 5-8, 1998, Denver, CO.
Zellou, A., Ouense, A., and Banik, A. "Improved Naturally Fractured Reservoir Characterization Using Neural networks, Geomechanics and 3-D Seismic", SPE 30722, Proceedings, SPE Annual Technical Conference and Exhibition, October 22-25, 1995, Dallas, TX.